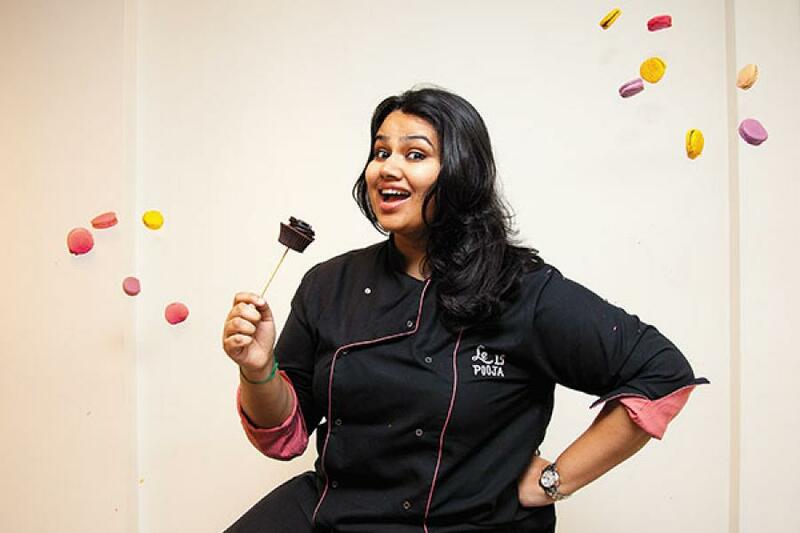 By the time she was a teen, Pooja Dhingra thought she knew a thing or two about desserts. She had grown up in a family with a sweet tooth, watched mum Seema run a baking business from home and was already a chocolatier of repute among her friends. At 18, she dumped law school and headed off to study hospitality management at Cesar-Ritz in Switzerland, the chocolate capital of the world. When she graduated, she thought her palate had been there and done that. Dhingra learned differently during her first week in Paris (where she was studying pastry-making), as the party chatter veered towards the dessert the French could die for: Macarons. “In all my 22 years, I had eaten enough pineapple cakes and Dutch truffle pastries to last me a lifetime, but never tried a macaron. That very weekend, I went to a confectionery boutique store, and queued up for 15 minutes to get in. Inside, there were rows of macarons in exquisite colours displayed on tables and in the fridge. I ate one, and I was hooked,” says Dhingra. Even as the concoction of meringue and almonds was melting in her mouth, she knew what she wanted to do for a living: Bring the French confectionery to India. Dhingra returned in March 2009, after passing out of Le Cordon Bleu, one of the finest culinary schools in the world, and started testing her Parisian recipes in her mum’s kitchen. Soon, she found she had far more than a geographical divide to bridge. While the hot and humid Mumbai weather often played spoilsport with the texture and consistency of her macaron shells, the local ingredients—chocolates, cream, butter—did not meet her exacting standards. That’s when the innovation began: She started mixing local produce with imported ones. After several trial runs (read: baking disasters), Dhingra finally zeroed in on the right recipe. Time to set up shop. In December, she rented a two-storeyed place in Parel, renovated it and, in March 2010, started operations with a seed capital of Rs 10 lakh from her family. There was no marketing blitz, yet Dhingra and her Le 15 Pattisserie hit the ground running after a sample tasting at an Andheri mall turned out successful. She set up a counter at a Worli salon, but landed her first real break when the Lower Parel outlet of Good Earth, a lifestyle store, offered her space. Soon after, a second outlet came up at the Palladium mall, rubbing shoulders with high-street fashion labels. With three outlets in close proximity, she shut the Worli shop and began scouting for another location. In March 2013, Le 15 opened in Bandra. Her decision was vindicated in 10 months as it became the best-selling outlet, just like her red-velvet cupcakes. As Le 15 gears up to ring in its fourth anniversary in March, Dhingra continues to consolidate the sweet spot. She is the first choice for the HNI clientele: Bollywood biggies like Salman Khan, Deepika Padukone, Sonam Kapoor are on her client list as is the Mukesh Ambani family. Her book will be out in a few months and Studio Fifteen, where she not only conducts baking classes herself but gets experts to share culinary knowhow, has had enough takers, she says. A chocoholic herself, Dhingra is also researching a line for people who are battling the bulge: She promises to serve up desserts that are sinful in taste but devoid of the guilt. Her balance sheet, too, is robust. While she had broken even in 10 months, she ended 2012-2013 with a turnover of Rs 1.55 crore and claims to have recorded a growth of about 250 percent in four years. Dhingra is looking to start outlets in Andheri and Colaba. On top of her bucket list, though, is a pan-India presence (besides visiting Japan that is. “Japanese pastry chefs are the best. There’s hardly anybody with such an eye for detail.”) and, to start it off, a shop in Delhi by year end. With such furious expansion plans in the oven, Dhingra is even open to a buyout: “Yes, that’s a big option. We have received offers before, but I wasn’t ready then. I am not too keen on the franchisee route as it tends to dilute the quality of the products.” She’s in talks with different teams to decide on the future course. At home, she keeps bouncing ideas off father Jaikishan and brother Vaarun. But the final call has always been hers. Kainaz Messman, whose Theobroma was among the earliest standalone gourmet pastry shops in Mumbai, believes it’s exciting times for the confectionery industry in India. “It’s great to start young. It gives you that much more time to learn. 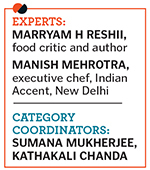 It’s refreshing to have around you chefs who learn the skills from abroad and set up business here,” she says. And, of course, if the chef has a sweet tooth, it can only help. Nice, i like this article.